TL;DR/ Short answer: no, it promotes radical self-acceptance over self-loathing. It promotes a kinder society over a culture rife with appearance-based bullying and body shaming and it promotes physical and psychological recovery from dieting and disordered eating. Let's begin by making something clear here: body positivity is a social movement, not a mere strap line splashed across a slim, young, able-bodied, white woman on a magazine cover (that's 'body confidence' you're thinking of). It applies to all bodies, of all ethnicities, abilities, ages and gender identities. The movement itself originally stems from the fat acceptance movement and it is this which is the sticking point for its critics, who misconstrue the word ‘acceptance’, as meaning ‘promotion’. The fat acceptance movement campaigns for a society where we do not shame or bully people based on their weight and where we do not treat people differently because of their weight. A society where we don’t put kids as young as 8 on a diet and set them up for a lifetime of eating disorders. It also ties in well with the Health At Every Size (HAES) approach, an anti-diet, health centred paradigm, whereby health is separated from weight loss and the focus is on improving lifestyle through self-care, intuitive eating, gentle nutrition and movement, instead of striving for weight loss via the traditional dieting paradigm. The HAES approach takes into account mental health in addition to physical health, rather than viewing it as an afterthought; a complete contrast to the comments made within diet culture; "Oh you're depressed, that's a shame, but look at the weight you've lost through not eating!". Body positivity or fat acceptance is not the same thing as ‘obesity promotion’; when a fat person on Instagram speaks of their body confidence, inner peace and happiness, they are not telling other people to binge eat themselves into cardiac arrest, as some writers would have you believe. In fact, body positive activists are among some of the seemingly few people on social media who are not telling other people how to eat (see images of avocado on toast and acai berries on overnight oats - but hey, if you're slim, young, pretty and #instafamous, you're automatically a health expert right?!). Instead, Body Positive activists are showing others that happiness and confidence can be experienced by anyone of size, independent of what the scale says. The existence of happy, confident fat people, is not a public health threat; you won't 'catch' obesity if a fat person has the audacity to walk down a street with their head held high. I understand the confusion. I myself, upon first discovering the body positivity movement when coming from the dieting mindset and a lifelong battle with disordered eating and poor body image, felt opposed to the idea of accepting my obese body. “Why would I want to do that?” I thought. “I don’t want to be fat, let alone accept it. All of my father’s illnesses stemmed from his poor diet and sedentary lifestyle. Surely if I remained obese I would continue down the same path?" My (since-reversed) diagnosis of pre-diabetes at age 18 seemed to confirm that. I also grew up witnessing my mother’s struggle with anorexia and constantly received the messages that food was calories, calories were bad, and that weight gain was the worst thing that could ever happen to you. So I really do get where the fear of being fat comes from, and why as a society we’re so reluctant to accept fat bodies. Especially in the UK where the idea of a cash-strapped NHS funding treatment for lifestyle-related illnesses adds fuel to the fat burning fire. Fat people acknowledge this. There isn’t a fat person out there who doesn’t know the health risks associated with their weight. Bashing them over the head with research and statistics about obesity-related health conditions (lifestyle-related conditions to be more accurate), does not help them in the slightest. Self-loathing, body shaming and fatphobia pushes people to diet. “Good, that’s what fat people need: a diet, go lose some weight!” say the ill-informed. But I’m yet to meet a fat person who hasn’t tried numerous diets. It’s not being confident in your body or radical self-acceptance that promotes obesity - it’s the very nature of dieting. Disrupting the hormonal balance responsible for appetite, satiety and fat storage. Increasing the risk of developing patterns of disordered eating or even a full-blown eating disorder. When we regain weight after a diet (which most people do within 5 years of intentionally losing weight through dieting), we put on not just more weight, but more body fat as an evolutionary response to perceived food shortage (calorie restriction). Our lower muscle mass, higher fat mass, disrupted hormones and consequently lower metabolism, then makes it even harder to lose weight on the next diet, and the next one, and the next one. Until the weight loss methods, we resort to, become even more drastic and dangerous. Tell me, how this path is in any way healthier than someone feeling confident in their body at their present size, feeling at peace with food, experiencing improved mental health and self-esteem and if/when they feel ready to, eventually feeling able to focus on improving their physical health through gradual adjustment of their lifestyle habits, with gentle nutrition and joyful movement? It’s becoming increasingly clear in the health and fitness industry, that dieting doesn’t work, and that an alternative approach is urgently needed for the sake of our mental health, as well as physical. Having long batted with my weight and relationship with my food and body, always knowing deep-down that another diet and an obsession with the scale wasn’t the answer I was looking for, I’m relieved to see a rapidly growing number of dietitians and other health and fitness professionals, taking an anti-diet stance and recognising the importance of body positivity and body acceptance. 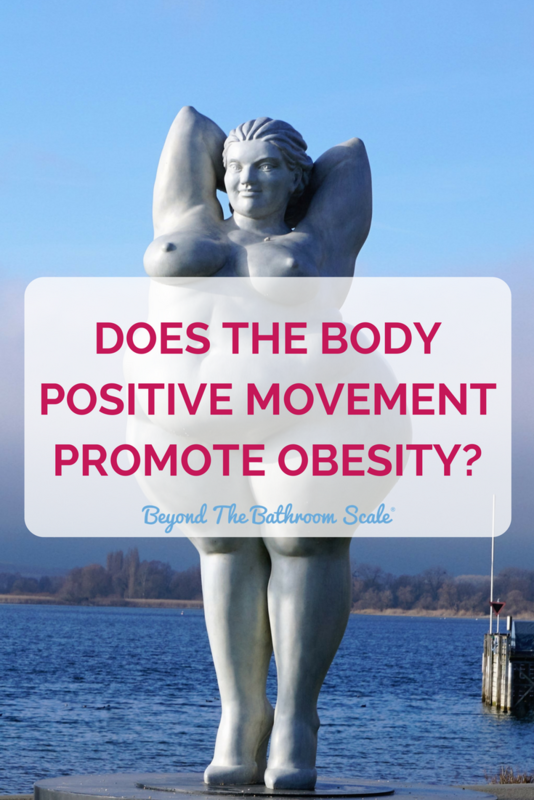 So to sum up, no, body positivity isn't promoting obesity. It's an instrumental part of the recovery process for disordered eating and life-threatening eating disorders. It's an essential part of the antidote urgently needed for the dieting society. And at the heart of it, it's really just about being kinder to ourselves and others, something which definitely needs to be promoted. Older PostAre you dieting because you feel out of control in your life?